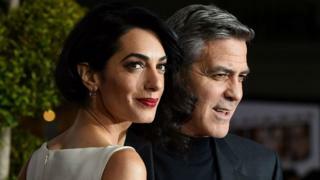 Prominent human rights lawyer Amal Clooney and her husband, award-winning actor George, are expecting twins, Matt Damon has confirmed. Speaking to Entertainment Tonight Canada, the actor explained Clooney had told him the news while they were working together last autumn. Damon said: "They're going to be awesome parents. Those kids are lucky." He was speaking after the news of the couple's pregnancy was revealed by CBS's The Talk host Julie Chen. Explaining how Clooney revealed the news, Damon said: "I was working with him last fall and he pulled me aside on set and I almost started crying. "I was so happy for him. And I was like, 'How far along is she?' And he goes, 'Eight weeks'. "I said, 'Are you out of your mind? Don't tell anybody else! Don't you know the 12-week rule?' Of course he doesn't. I was like, 'just shut up, man'." Another source close to the couple, quoted by People, said they were "very happy". The Clooneys' representatives have not yet commented. George and Amal Clooney married in Venice in 2014 with a star-studded list of guests who included Damon and Bill Murray. Rumours that they might be expecting began to circulate last month when Amal was spotted wearing a loose-fitting dress. George, 55, has starred in numerous Hollywood films and has won two Academy Awards. Amal, 39, has represented a number of high profile figures, including former Ukrainian Prime Minister Yulia Tymoshenko and Australian Wikileaks founder Julian Assange.